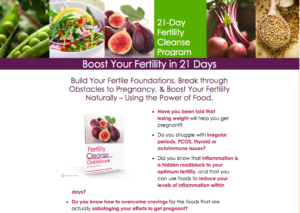 When I launched my 21-Day Fertility Cleanse Program, I was thrilled to witness the transformative power of food in the fertility and lives of women couples just like you. It was amazing to see not only the ease with which clients lost weight, regained their energy, conquered their PMS, reclaimed control over their food and did something good for themselves, but also the community that was created in our private Facebook group. And, some special news…As I write this it’s just 6 weeks after our cleanse group completed their program and I’m especially excited to share that three of our participant couples are now pregnant! Congratulations!! YOU can get in on all the goodies, too, as registration is now open for my 21-Day Fertility Cleanse Program! Don’t miss the opportunity to receive my support, the cheers of others who really get what you’re going through, and the ability to boost your chances of conceiving a healthy baby – starting right now. Register here. P.S. Some of the folks who did their cleanse with me initially felt so well they want to do it again! You’ll meet them in our private Facebook chat group as your cleanse alumni mentors! Looking forward to having you in the fertility cleanse program.